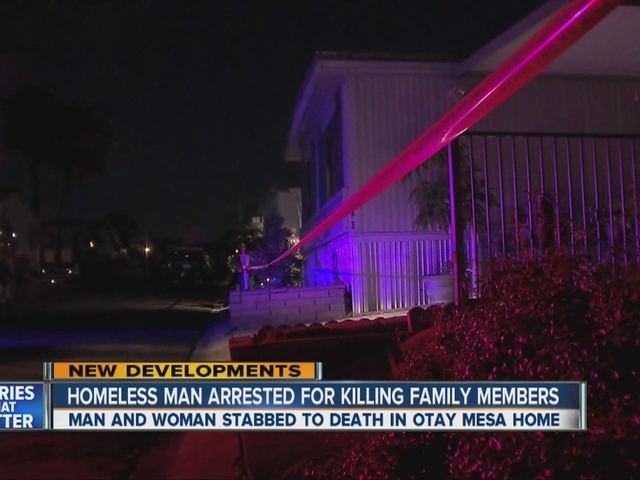 SAN DIEGO -- A 29-year-old transient with an extensive criminal record was behind bars on suspicion of stabbing his grandmother and uncle to death inside a mobile home in Otay Mesa Monday afternoon. Raymond Joseph Chatterfield was taken into custody around 7:30 p.m. Monday at a Jack in the Box restaurant on 30th Street -- about a half-mile from the mobile home park on Beyer Way where his grandmother, 78-year-old Donna Chatterfield, and his uncle, 54-year-old Kenneth Chatterfield, were found dead 3 1/2 hours earlier, according to San Diego police Lt. Paul Rorrison. Police described Raymond Chatterfield as a transient. 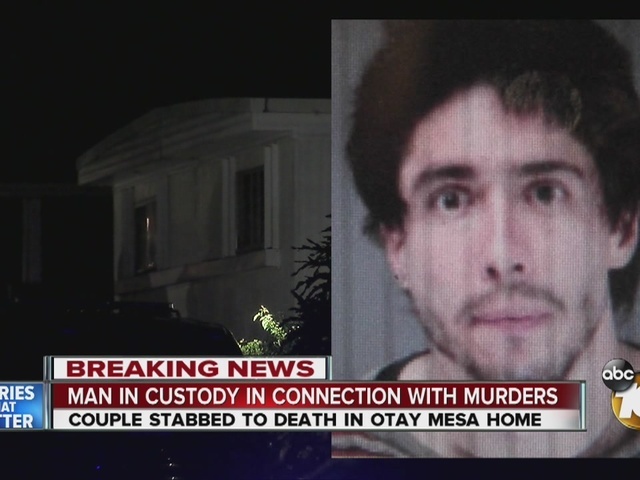 He is being held in the San Diego Central Jail on two counts of first-degree murder. Donna was Kenneth's mother. 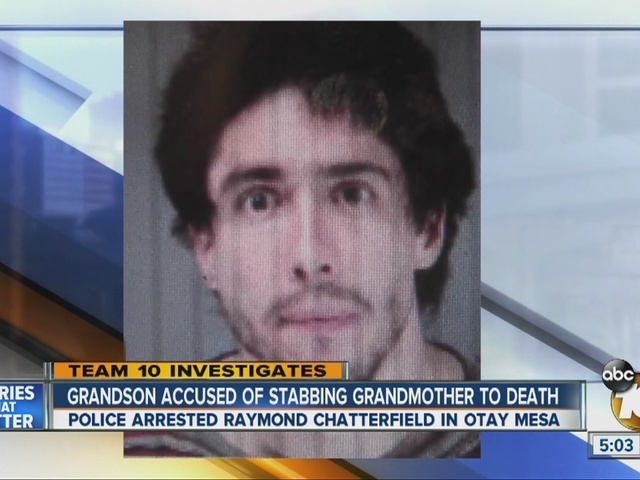 Raymond Chatterfield was Donna’s grandson and Kenneth’s nephew, police said. Police officers were initially sent to the Rancho Chula Vista mobile home park, a retirement community in the 1000 block of Beyer Way, shortly before 4 p.m. Monday when someone called 911 to report an unconscious man and woman inside a residence, Rorrison said. The victims' bodies had both sustained multiple stab wounds and were found on the floor. Rorrison said paramedics attempted to revive them, but they died at the scene. Their names were not immediately released. Investigators are still notifying the next of kin, but property records and neighbors tell 10News the victims are a 78-year-old woman and her adult son. The victims were related to Chatterfield and often gave him food. Court records show Raymond has a lengthy criminal past. He has one 2007 felony conviction for elder abuse and 11 misdemeanor convictions for various offenses, including five counts for being under the influence of a controlled substance, three counts for violating a protective order and one count each for meth possession, contempt of court and theft. There were two restraining orders filed against him by Donna. The first on April 7, and the second on Nov. 5. His most recent arrest came on Oct. 16 for violating the restraining order filed by Donna. A trial date had been set for Dec. 17. 10News also learned Raymond was released from jail in the last week. The circumstances of why he was in custody and why he was released were not immediately known. Raymond was arrested on the murder charges Monday after a neighbor recognized his picture in the media. "I couldn't believe it and then I started watching all the news feeds and I still couldn't believe it," neighbor Glenn Laird said. Laird told 10News he has lived across the street from the victims for the last 15 years. "Kind of at a loss for words, she (the mother) was like a second mom," said Laird. Raymond is scheduled to be arraigned on Thursday afternoon.